A great benefit of installing sintered stone as wall cladding indoors and outside is the fact that it’s lightweight and extremely durable. We like to call it “spectacularly indestructible” for its beauty and durability. 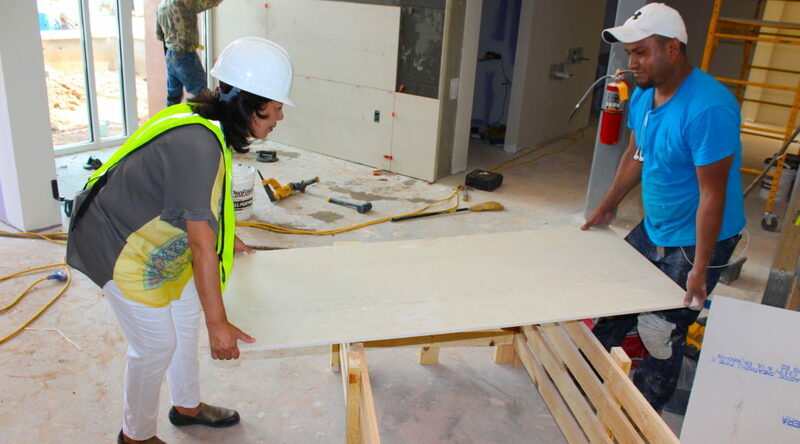 In this photo you see our fearless leader Laura on the job site, helping to move Dekton sintered stone at the Preston Development Company headquarters under construction in Cary with the Poythress Commercial Construction team. 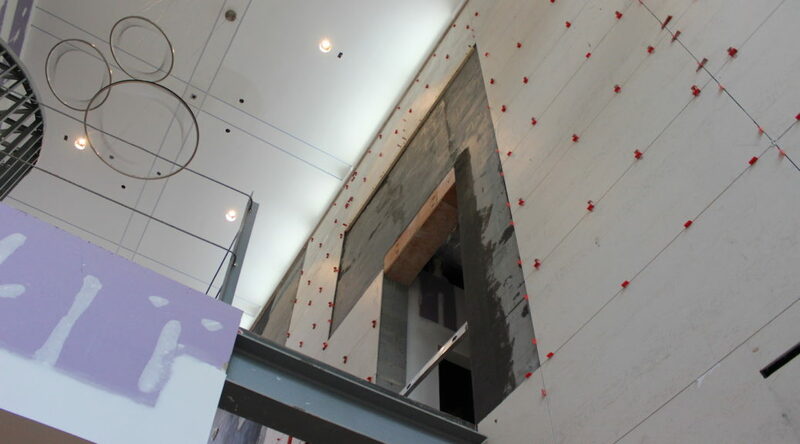 We’ve been hard at work in the month of August installing sintered stone wall cladding at the Preston Development Company headquarters in Cary under construction with Poythress Commercial Contractors. This Dekton sintered stone is made by Cosentino and is ultra-durable and perfect for wall cladding, because of its ability to be cut very thin. Ask us how we can help you implement sintered stone in your next project. We’re excited to share our latest sintered stone works of art used in commercial applications. Take a gander at “Opera” Dekton by Cosentino and “Eternal Marquina” Silestone by Cosentino. 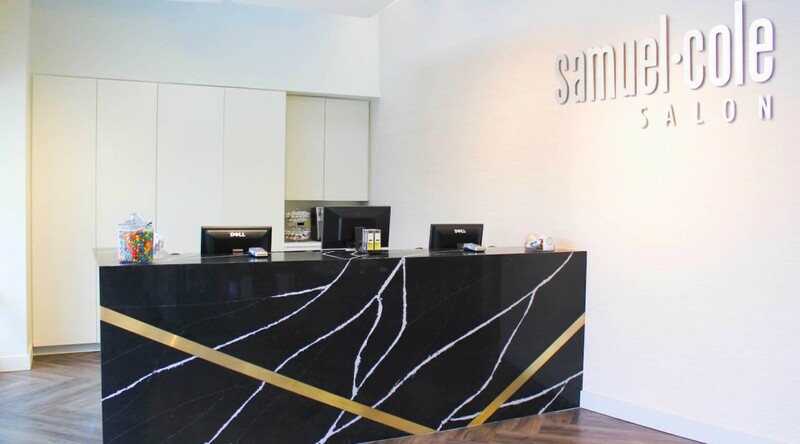 Two beautiful, incredibly durable surfaces we recently fabricated and installed at Samuel Cole Salon in Raleigh. The interiors were designed by Rima Nasser of TEW Design Studio. Over the past month we’ve had the opportunity to custom-fit the marble holy water font at the altar of Holy Name of Jesus Cathedral Raleigh. 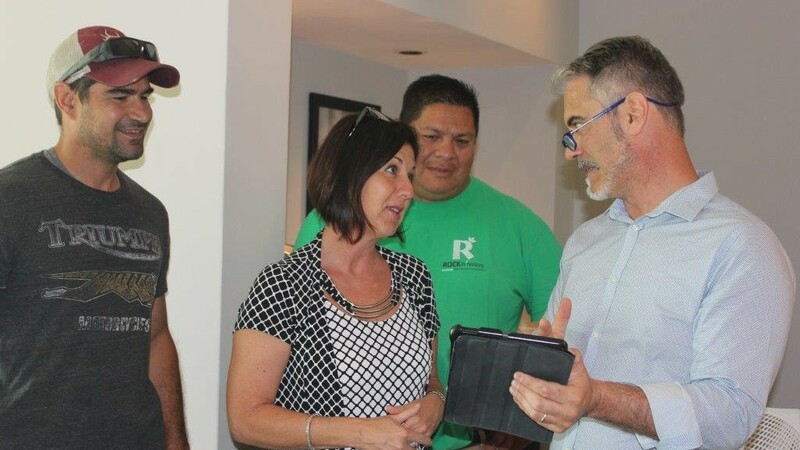 This high-profile project enabled us to host famous Italian stone consultant Roberto Pagliari in our studio! Roberto was commissioned to select the gorgeous stone throughout the Cathedral to bring to life architect James O’Brien’s vision.